Volunteers using the web-based Milky Way Project brought star-forming features nicknamed “yellowballs” to the attention of researchers, who later showed that they are a phase of massive star formation. The yellow balls — which are several hundred to thousands times the size of our solar system — are pictured here in the center of this image taken by NASA’s Spitzer Space Telescope. Infrared light has been assigned different colors; yellow occurs where green and red overlap. 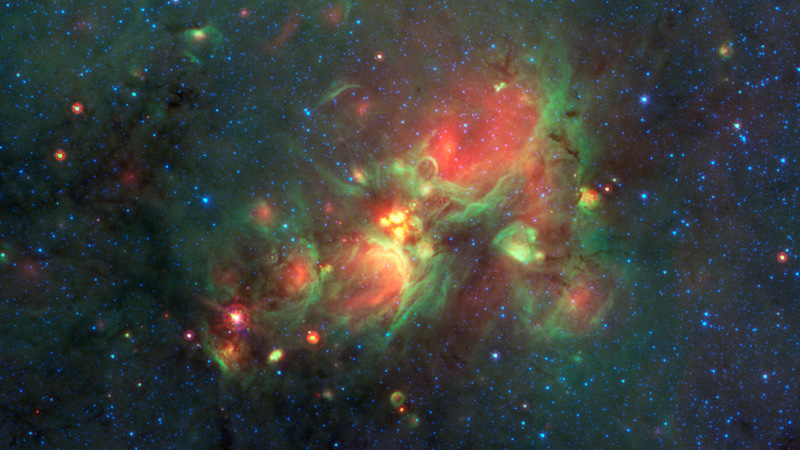 The yellow balls represent an intermediary stage of massive star formation that takes place before massive stars carve out cavities in the surrounding gas and dust (seen as green-rimmed bubbles with red interiors in this image). Infrared light of 3.6 microns is blue; 8-micron light is green; and 24-micron light is red. This series of images show three evolutionary phases of massive star formation, as pictured in infrared images from NASA’s Spitzer Space Telescope. 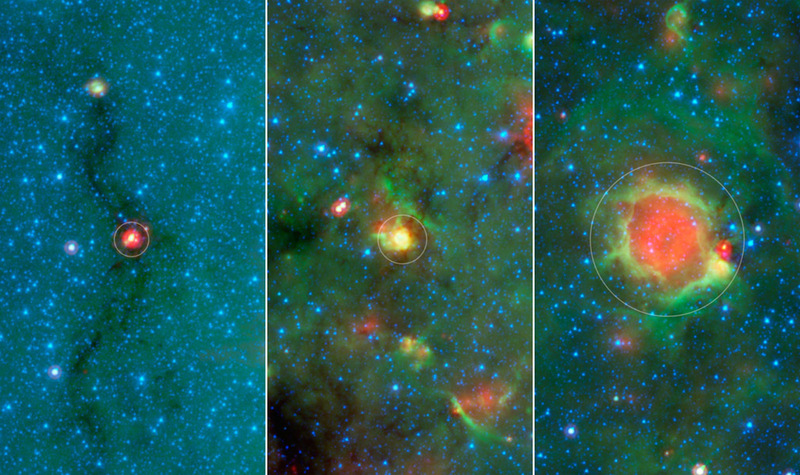 The stars start out in thick cocoon of dust (left), evolve into hotter features dubbed “yellowballs” (center); and finally, blow out cavities in the surrounding dust and gas, resulting in green-rimmed bubbles with red centers (right). The process shown here takes roughly a million years. Even the oldest phase shown here is fairly young, as massive stars live a few million years. Eventually, the stars will migrate away from their birth clouds. In this image, infrared light of 3.6 microns is blue; 8-micron light is green; and 24-micron light is red. Milkyway@Home uses the BOINC platform to harness volunteered computing resources, creating a highly accurate three dimensional model of the Milky Way galaxy using data gathered by the Sloan Digital Sky Survey (SDSS). This project enables research in both astroinformatics and computer science. Milkyway@Home is a joint effort between Rensselaer Polytechnic Institute‘s departments of Computer Science and Physics, Applied Physics and Astronomy. Feel free to contact us via our forums, or email astro@cs.lists.rpi.edu. Web based Milky Way project would open up new opportunities for amateur astronomers. Thank you. How about studying the intricacies of the astronomical processes and phenomena in the Milky Way?